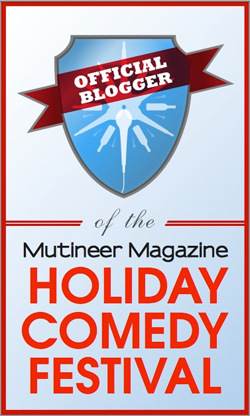 If you haven’t yet run into Mutineer Magazine (Twitter)…now is the time! 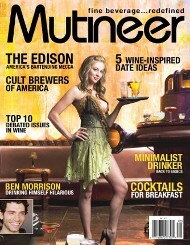 MM is the best new drinks culture magazine to come out in decades, if my opinion matters for anything. While they aren’t exactly new, celebrating their one year anniversary with this issue #7, they have already had a quite an impact on the beverage industry during their explosive growth. No drink is left unmolested, with features in virtually every issue on wine, beer, spirits and non-alchos. This latest issue also contains my very first print article. I accomplished this task by secretly pouring the Absynthe that was kindly offered to me by Head Mutineer Alan Kropf (Twitter) into an acidic hole in the floor below me at the first WBC, last year. Meanwhile as Alan sunk greener and greener, I successfully negotiated my first piece, whaahaa! MM has been extremely supportive of the blogosphere forming a great synergism. They also have their own pretty rad blog, themselves. Anyhow, I decided to join my two passions for this first assignment and tackled the link between grapes and health. Resveratrol is the compound (or Pirates’ Booty) found in grape skins that conveys many of the health benefits that have been attributed to wine over its long history. I break down the latest facts and promising finds about this tiny organic molecule. Need to find the latest issue? You can find them nation-wide at Barnes & Noble, Borders, Amazon, Vons, Safeway, Books-A-Million, Hastings and B. Dalton. Or, just check out their snazzy new Mutineer Locator. You best plan however, is just to fork out the $15 bucks and subscribe. Enjoy! Ward Kadel - @drXeNo is the founder of Vinopanion wine blog, the West Coast Ambassador & Staff Blogger for WineLog.net and Le Wine Buff for Bordeaux.com (CIVB). He will try any and all wines and tends to write about the parts of his life that include wine...like virtually all of it! He and his wife grew up in Napa and Sonoma and they still live in the Napa Valley. View Ward's WineLog and check out the wines he's recommended with his WKBadges. Follow him on Twitter and Like Vinopanion on Facebook. Contact him: "Ward at WineLog.net". Ward happily accepts samples but does not guarantee a review, positive or negative. Hello Andy! Thanks for checking out the blog and spreading the word. I really appreciate it! Great to hear, buddy! Thanks for letting me know, Alan! Philip: Don’t worry…I had the same issue, initially! The Resveratrol article is KILLER! People R INTO IT! Great job! How embarrassed I am! I was hypnotized by the cover model. Never saw you article. Bad me!!! Hey there Jeff! Thanks for the comments and I definitely hope to work more with you in the future. SD Lounger: Thanks for checking out the mag and my piece! I loved the piece on Resveratrol. Nice job. Congrats on it being your first printed piece…hopefully more to come in the future. And thanks for supporting our rebel publication. © 2019 Vinopanion and WineLog.net. All Rights Reserved.